July 28 (1907) is the birthday of Earl Tupper. Burp. Inventing Tupperware isn’t really an unfortunate way to be remembered, but Tupper’s rags-to-riches-to-escaping-to-an-island story is still pretty odd. Tupper was born in 1907 and had a modest upbringing on a New Hampshire farm. 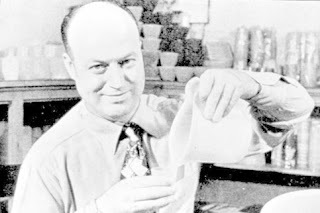 Always a tinkerer, Tupper eventually secured a job with the Dupont Chemical Company in 1937 where he figured out how to take a nasty oil refinement waste product and turn it into a tough, flexible, and translucent material. He struck out a year later to form his own company and, in a scene straight out of It’s a Wonderful Life, secured World War II defense contracts to make the plastic parts for gas masks and signal lamps. These successes eventually led to the post-war development of household products with his patented burping “Tupper Seal” and, eventually, Tupperware. It was his business partner, Brownie Wise, who came up with the idea for the Tupperware Home Parties that became wildly popular in the late 1940s and early 1950s. “If we build the people, we’ll build the business,” she famously said. Tupper fired her in 1958. Tupper then proceeded to divorce his wife, sell his company, abandon his citizenship, buy an island, and move to Costa Rica where he could live out his days without paying U.S. taxes. He died in 1983.